If you want a lighter dish, you can substitute turkey broth for white wine. To marinate turkey: combine turkey and all marinade ingredients in a non-reactive bowl. Refrigerate for at least 2 hours up to overnight. Remove thighs from marinade and shake off excess liquid. 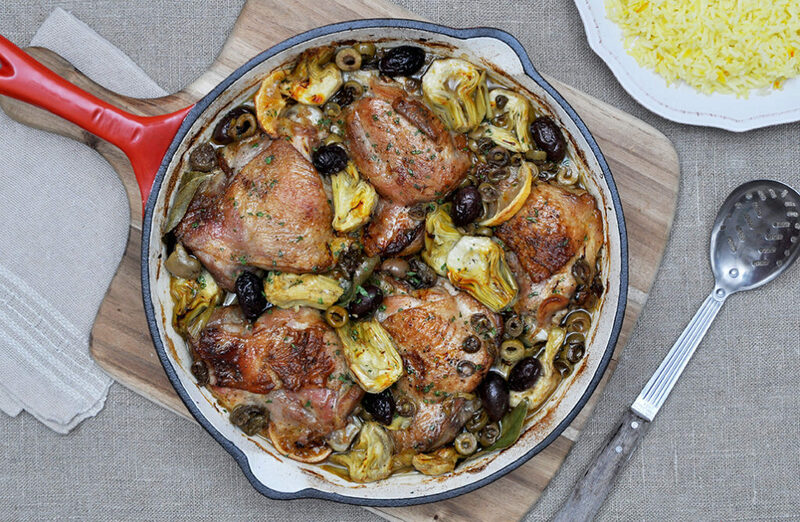 Add olive oil to an oven-proof skillet and heat. Sear turkey until browned on both sides. Add onions and garlic to pan and sauté on medium heat until browned, 2 minutes. Return turkey to the skillet. Lightly season with salt and pepper. Add wine, artichokes, olives, lemon, bay leaf and saffron to pan. Simmer on low heat for 15 minutes. Transfer skillet to the oven. Bake at 350°F for 1 hour until meat is fork tender and falling off the bone. 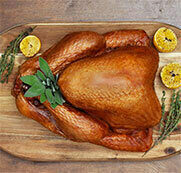 Check on turkey every 30 minutes and add 1/3 cup water if pan juices start to dry out. You want to end up with a thick and flavourful sauce. Serve with your favourite rice dish on the side.